When the usual painted nails become too boring, try something new and add an ‘oomph’ factor to your nails. Experiment with nail art; this time give your nails a 3D effect. Not only is the design exceptionally easy to paint but will also stand out and look unconventionally hip. Here is a simple tutorial that would help you up your nail-art game. Add a coat of transparent nail polish over all your nails. The Maybelline New York Color Show Nail Lacquer in Crystal Clear is a suitable product to opt for. Once applied, let it dry. Apply a layer of a beige nail colour over all your nails. Let it dry. Apply a second layer if required. Use the Sugar Tip Tac Toe Nail Lacquer in Burn Your Beiges. It would be the best colour that would bring this design together. 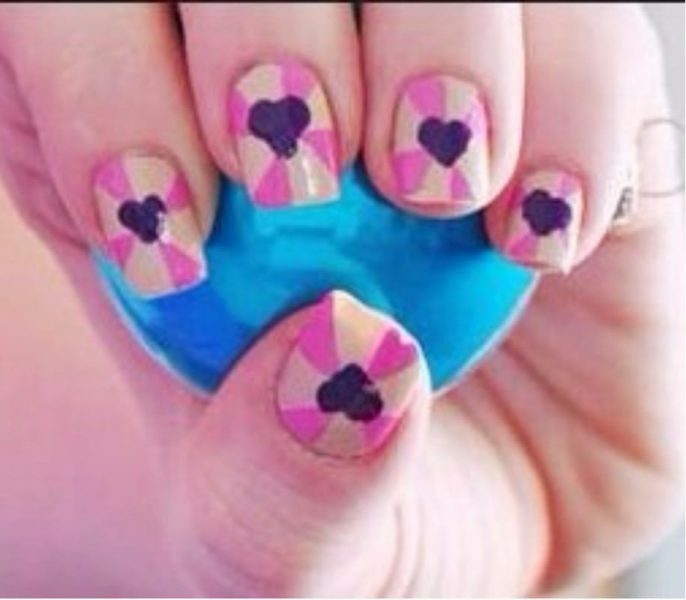 Paint a heart in purple right at the centre of all your nails. Use a thin paint brush for precision. The Lakme Absolute Gel Stylist Nail Colour in Purple Orchid offers brilliant quality a rich colour as well as texture. Draw a fan blades around the heart like shown in the photo. It is important to use a precision brush. Begin from the centre and fan it out towards the edges of your nails. Four blades are enough. Opt for a bright pink nail colour like the Lakme 9 To 5 Long Wear Nail Color in Rose Rush. The final step would be to lock in your 3D design by adding a final layer of transparent polish to your nails once the previous coats have dried. There you go, you’d have achieved a simple 3D design in no time. Bright and quirky, these nails are sure to catch attention.